I recently had the opportunity to pick up a couple of 8861s for my lab/home phones, and thought I would do a writeup on my initial impressions. The 8800 series phones offer an updated look, and a number of new features. 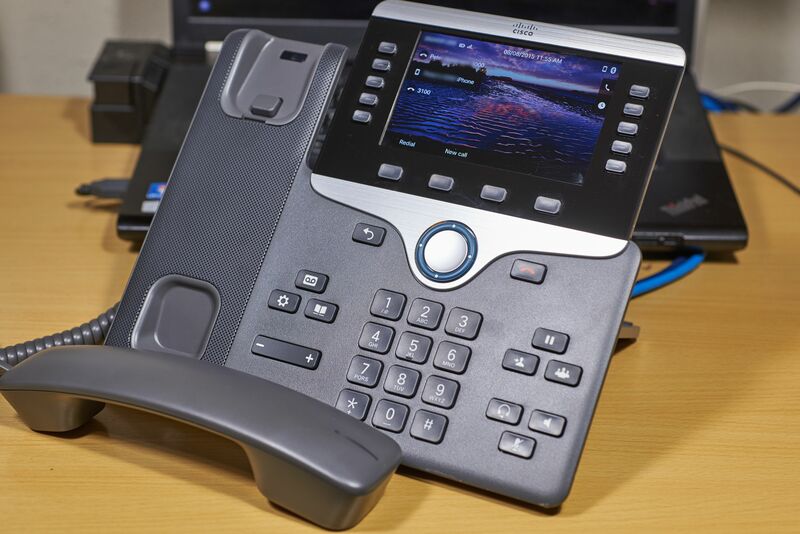 The 8800 series also continues the move from soft keys to more hard keys, with hard Back, End Call, Hold, Transfer, and Conference keys added to the Voicemail, Settings (now combined with services), Directories, Headset, Speaker, and Mute buttons on the 7900 series. I don’t know how I feel about the move to more hard keys. Soft keys have the advantage that only the necessary ones are displayed, but sometimes important ones can get buried. Hard keys will also have an advantage when using apps like IP Phone Agent, since the call control soft keys are hidden by the application soft keys. Also, in keeping with the new Cisco phone lines, they are SIP only, no option for SCCP. Compared to the full size 7900 phones, the 8800s are about the same size, or slightly smaller, but are definitely sleeker looking. The handset is noticeably smaller, and retains the MWI in the top of the cradle with the clear plastic insert that allows it to shine through the handset. I think the 7900 handset is a little easier to prop between your head and shoulder. The area surrounding the cradle is a grille for the speaker phone. The black bezel surrounding the screen is removable, held on by magnets. The back retains the normal headset, handset, aux, 2 network, and power jacks. The 8861 and 8865 also add jacks for external speakers and mic, and a USB port. 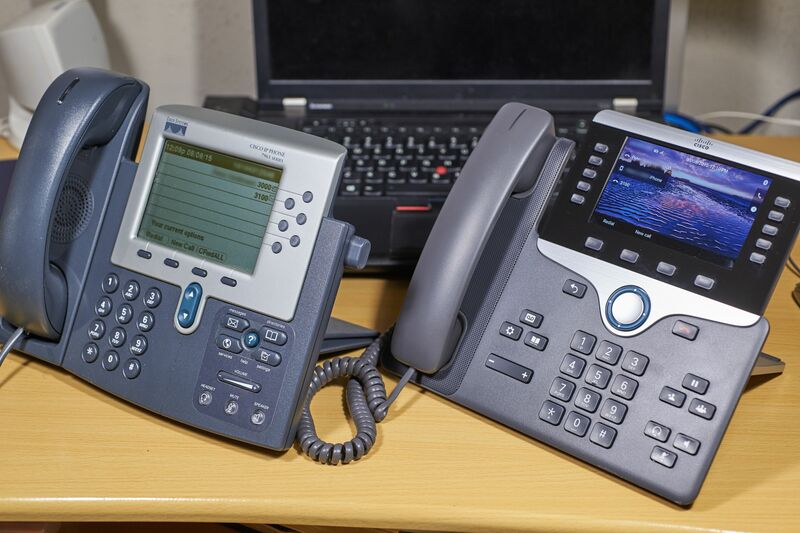 All the 8800 series desk phones have 5 line keys, and gigabit ethernet. The 8845 and above also include bluetooth, which allows the phone to both use a bluetooth headset, or, more interestingly, act as one. The phone can pair with an iPhone or Android phone, and the audio can be run through the 8800. I have been using mine for improved speaker phone quality in my home office for a few weeks, and it works well. Along with the improved microphone and speaker, you gain hard keys for DTMF and mute, which are very handy to have on conference calls. Contacts can also be transferred from the mobile phone to the directory on the Cisco phone. The 8861 and 8865 add WiFi, which I was planning to use to place a phone in a part of the house that is difficult to wire. Unfortunately, the 8800 phones require the Power Cube 4, which is different than the one for the 7900 phones, so until I get around to ordering one, I will not have much chance to test the WiFi capabilities. The 8851 and above have USB ports, which can be used for changing smartphones or tablets, as well as some accessories. I have a Logitec USB headset that is normally used with my computer when using my softphone, and it worked without any hassle when I connected it to the USB port on the 8861. Overall, I think these are a strong upgrade to the 7900 series, with several good reasons to upgrade. Is it worth a full rip and replace? Probably not for all users just yet, but the gigabit ethernet, bluetooth, and WiFi capabilities definitely provide strong reasons for some applications and users. Are you planning to upgrade? If so, what is the deciding factor? How did you get the 8861 handset working? CUCM, CME or hack it and use with a SIP service?